A while back my ESP, ABS, and traction control lights came on. I changed the four wheel sensors one by one with no success. 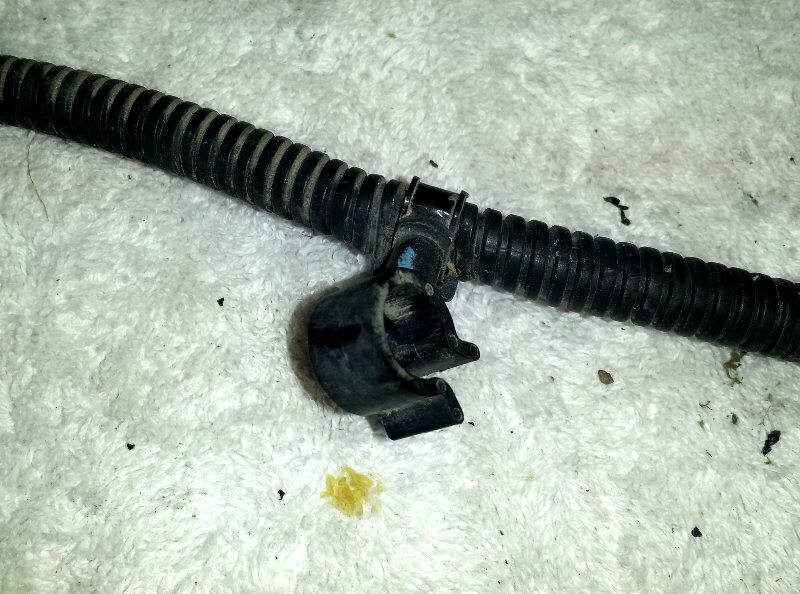 Then I changed the clock spring sensor in the steering column. No joy. 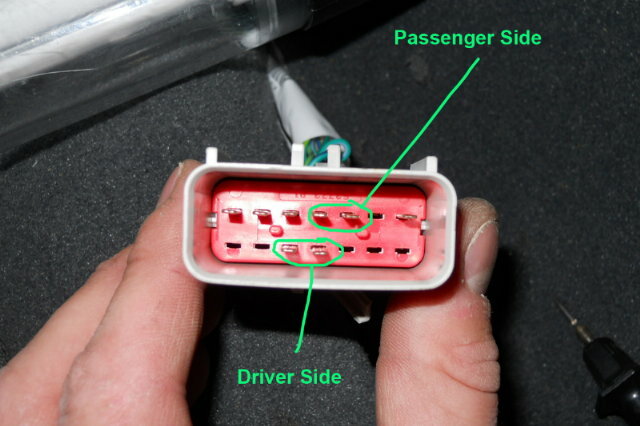 Some internet searching revealed that sometimes the problem was in the wiring to the rear sensors. It ended up being my problem, too. It's actually easy to check the wires so I thought I'd post it. If I had done this first I could have saved myself some time and money. Disconnect the ABS harness at the ABS computer. Release the two latches then raise the connector up like a lever, then pull it back. It's easy once you understand how it works. Disconnect both rear sensors. Use a paper clip or a short piece of wire between the two connections. You've now turned the two sensor wires into one long wire that's easy to test. 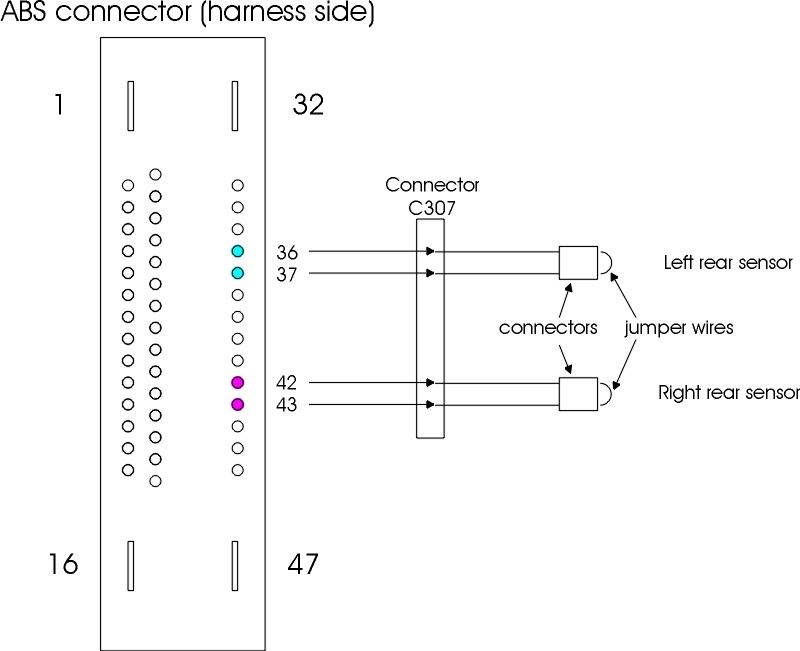 Using an ohmmeter, measure continuity between pins 36 & 37. Repeat for pins 42 & 43. In my case pins 42 & 43 had continuity but 36 & 37 didn't. Here's how I continued my troubleshooting. C307 connector...photo courtesy of 'devlish' from Lostjeeps.com. There's a connector under the left rear seat...connector C307 to be exact. The wiring for the rear ABS sensors goes through this. You can remove the four front bolts (10mm socket) for the rear seat and the seat will fold up against its back. Use a bungie cord to hold it up. 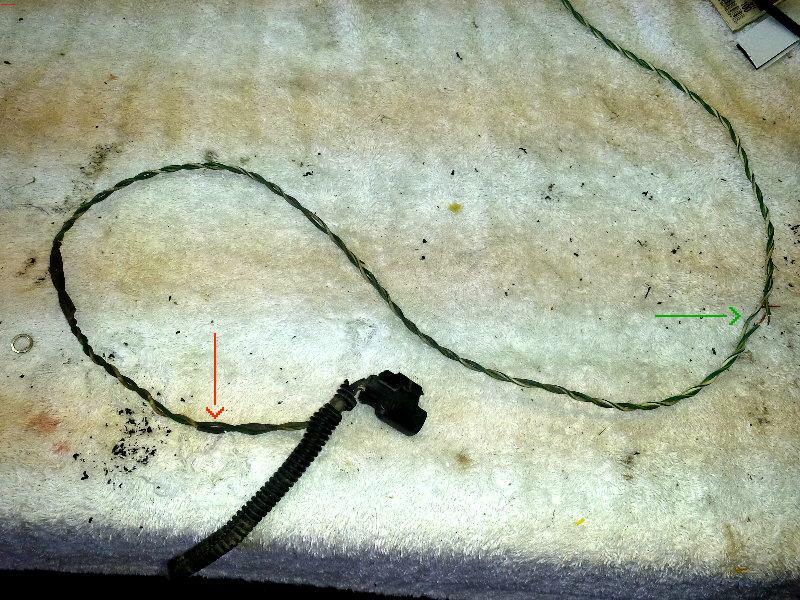 Remove the carpet and reveal the connector. Disconnect it. From here you just ohm out each wire until you find the bad one. Knowing what I know now, I would start with the four from C307 to the wheel sensors first. In my case it was the wire that went to pin 36. It was broken (inside the insulation) about two inches from the wheel sensor connection. These twisted-pair wires are stiffer than 'normal' wire and I can see why they'd break. Update Sept 2016: Several months ago my three lights came on again. I purchased a better quality code reader that reads the brake bus. It said the issue was with the left rear sensor. I suspected another break in the wire. I finally got around to working on the problem. To make it easier to work on I cut the cable off and went to the workbench. I was able to find the problem with a visual inspection. The new break is the green arrow. The one I had a few years ago is the red arrow. The wire broke where it passed through this tie point. I fixed the break, reinstalled the cable, and all is working well again.